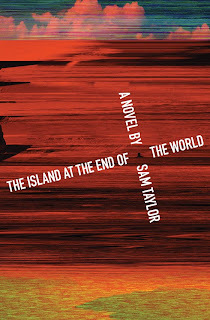 Creativity and Penguin Books sponsored a contest to design the cover of The Island at the End of the World by Sam Taylor, author of The Amnesiac. Thanks to reader Tanya for bringing it to my attention. 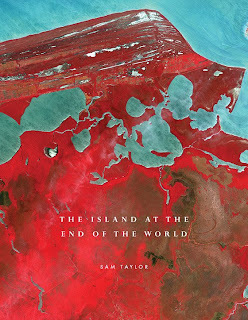 A chilling novel about the near future, where most of the world has been destroyed by catastrophic floods. 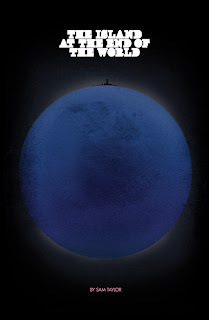 As a father and his three children begin to rebuild their lives alone on an island, his youngest son Finn begins to question how they arrived there and why they alone have been spared. Finn's search for understanding takes an unexpected turn when a strange man named Will swims ashore, and he appears to know quite a bit about this family and the circumstances that surrounded the floods. But Finn's father is determined to keep him silent and is willing to do anything to prevent Will from disturbing his family's idyllic life on the island. 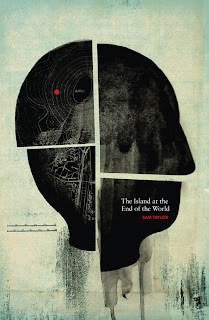 Sam Taylor's The Island at the End of the World is a riveting post-apocalyptic tale that explores the darkness that lies within the hearts of men. There's some pretty nice work here; out of the 25 final designs, these are the four that caught my eye. See all of them here. Winner announced September 25; I'll try to post the winning design shortly afterwards. The one with the divided head is VERY nice.. I also like the one with the intersecting type. Jesus. I don't like any of these. The last one is the best and most interesting. I love the top one -- it looks straight out of 700 Penguins. anon9:01: Gotta be a placeholder. The winner is announced tomorrow and that's not in the final group, as far as I know.